Width: 12mm (approx. 1/2"). Thickness: 1.25mm. 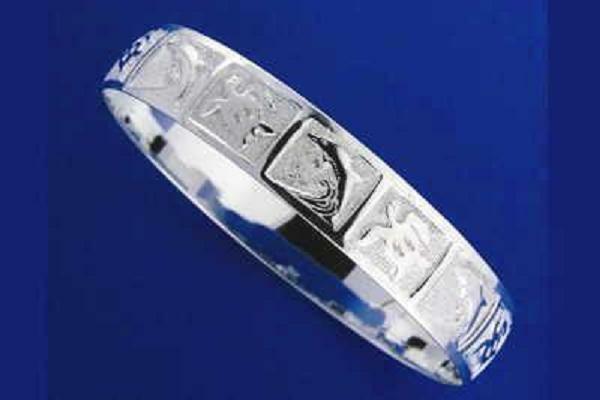 Design: hand engraved swimming dolphin and honu turtle. Stamp: 925. Weight approx 24 grams. 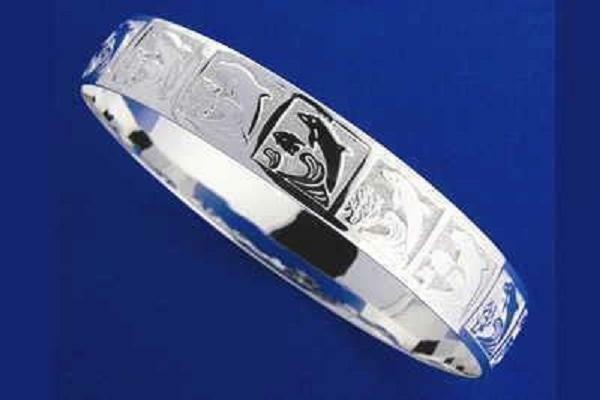 SILVER 925 HAWAIIAN BANGLE BRACELET SWIMMING DOLPHIN HONU TURTLE 12MM 8.5"
Width: 12mm (approx. 1/2"). Thickness: 1.25mm. Design: hand engraved swimming dolphin and honu turtle. Stamp: 925. Weight approx 24.9 grams. Width: 12mm (approx. 1/2"). Thickness: 1.25mm. 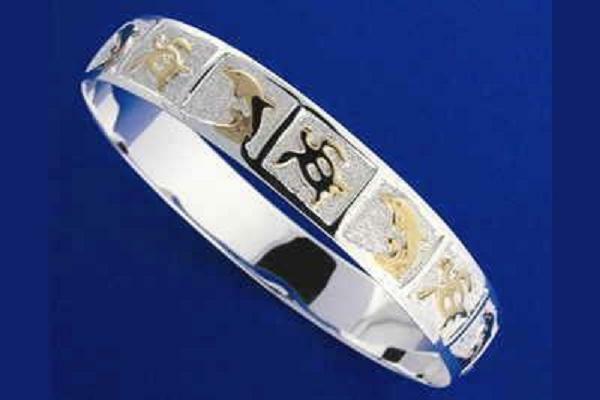 Design: hand engraved swimming dolphin and honu turtle. Stamp: 925. Weight approx 26 grams. Width: 12mm (approx. 1/2"). Thickness: 1.25mm. Design: hand engraved swimming dolphin. Stamp: 925. Weight approx 22.1 grams. Width: 12mm (approx. 1/2"). Thickness: 1.25mm. Design: hand engraved swimming dolphin. Stamp: 925. Weight approx 23 grams. Width: 12mm (approx. 1/2"). Thickness: 1.25mm. Design: hand engraved swimming dolphin. Stamp: 925. Weight approx 24 grams. Width: 12mm (approx. 1/2"). Thickness: 1.25mm. Design: hand engraved swimming dolphin. Stamp: 925. Weight approx 24.9 grams. Width: 12mm (approx. 1/2"). Thickness: 1.25mm. Design: hand engraved swimming dolphin. Stamp: 925. Weight approx 26 grams. Width: 12mm (approx. 1/2"). Thickness: 1.25mm. Design: hand engraved swimming dolphin and honu turtle. Stamp: 925. Weight approx 22.1 grams. Width: 12mm (approx. 1/2"). Thickness: 1.25mm. Design: hand engraved swimming dolphin and honu turtle. Stamp: 925. Weight approx 23 grams. Bracelet length: 7 1/2 inch. 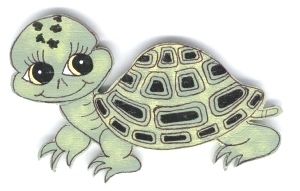 Turtle size: 12.90mm (approx. 1/2") wide and 13mm (approx. 1/2") long. Crab size: 11.20mm (approx. 7/16") wide and 11.80mm (7/16") long. Dolphin size: 15mm (approx. 9/16") wide and 15.75mm (approx. 5/8") long. Bracelet weight: 8 grams. Clasp: lobster. Stamp: 925. Width: 15mm (approx. 5/8"). Thickness: 1.25mm. Design: hand engraved swimming dolphin. Stamp: 925. Weight approx 29.8 grams.